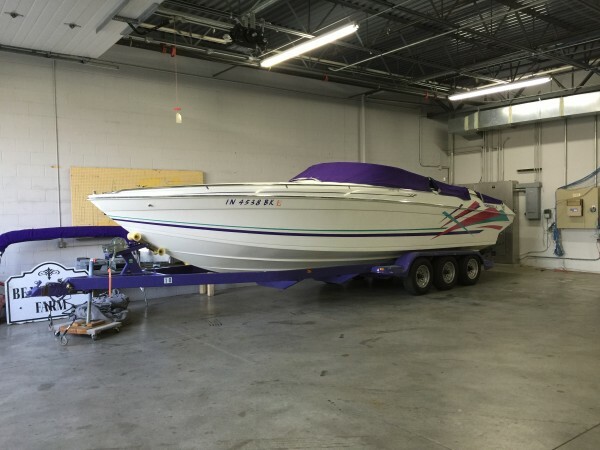 1995 Formula 303 SR-1 V-hull powerboat (VIN: TNRD3792J495), white gel coat hull with Catalina design exterior Imron graphics (purple green and red), white interior with accents matching the exterior colors, twin 454 Mercruiser 7.4L Magnum EFI engines (385 hp x 2) Mercruiser BravoOne outdrives, Quicksilver Mirage 3-blade SS props (24P), Silent Thunder exhaust. The boat has a 45 mph cruising speed & tops out just at 69-71 mph on GPS. 6-passenger capacity, 115 gallon fuel capacity, dry weight of approx. 7,250 lbs., 30'3" total length with swim platform, 8'3" beam, 36" draft, 5’ bridge clearance. Options fitted incl. fresh water system with transom shower, engine compartment Sea-Fire Halon discharge fire suppression system, Full snap-on cockpit cover for trailering and short term storage, tie-down full boat cover for long term (winter) storage. Kiekhaefer zero-effort command drive levers & throttles, VDO Vanguard gauges with full dash instrumentation, McLeod power drop down bolsters & power adjustable footrests, 120V AC & 12V DC power system with 1,500W inverter / shore power and interior power receptacles, Shipmate RS8300 offshore marine radio, upgraded Pioneer stereo with CD and helm remote, Thetford 775 MSD dockside pumpout head, FloJet on-demand fresh water system with bar & sink, Goldstar microwave oven, Norcold refrigerator / ice maker, always stored in a heated and air-conditioned building (summer and winter), fresh water use only and never left in water overnight, 3 owners since new, cleaned after every use and hand waxed twice a month!, metal rub rail has never been off the boat and is in excellent condition, extremely clean boat inside and out, hull and paint are exceptionally nice, no rips or tears in the interior vinyl, carpet is in excellent condition, all books and manuals, just completely serviced, an extremely well made and solid powerboat, runs very well, very smooth, powerful and fast. The deep V-hull handles great in rough water and is yacht certified. I am extremely particular and can pretty much guarantee you won't find a cleaner pre-owned powerboat. Matching 34 foot Eagle triple axle trailer included, offered at $39,500.00 / best offer. Call or text Brian @ (812) 760-5513 - located in Evansville, IN 47715. 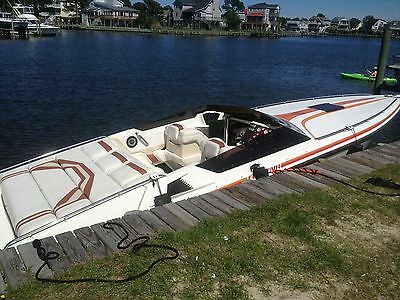 Up for bid is a 1990 Fountain Fever 27 with twin 454 Mercruiser Engines and a 2005 Eagle Tandem Trailer. This is a very solid, non-ventilated fountain hull weighing in at nearly 6,000 pounds. The gel coat and decals are in excellent shape. The interior is in excellent shape and I would guess has been recently redone. The same is true with the cockpit upholstery with only a few staple pulls and an issue with the bolster mechanisms. The plungers are still in place, but the bolsters are fixed in the seated position. There is one scrub mark on one side panel and a small 1" mark on the top driver's bolster upholstery and no other rips, tears, holes anywhere. I believe it would take some hardware to correct the bolster problem, but I didn't look into it in any detail. I prefer to drive sitting down. The entire gauge array was replaced with new Livorsi gauges and candy apple red bezels. That alone was several thousand dollars just in new gauges (there are 15 including the GPS speedometer with recall function). The engines are stock, equipped with Holley carbs, spark arresters, Thunderbolt ignition, etc. No modifications have been made to my knowledge, though I do believe at least one of the engines has been rebuilt (prior history is a little lax here). Both engines run great and the hour meter shows 26 hours, which is when the gauges were changed. See photos for the original Fountain test records showing 73 MPH @ WOT - Wide Open Throttle. The boat still performs as new hitting a minimum of 70 MPH without breaking a sweat, full of fuel, gear, passengers, and verified by the on-board Livorsi GPS speedometer with memory function. The boat is propelled by two Mercruiser Bravo One Drives with Mercury Mirage Three Blade, 25 pitch Stainless Props, complemented by Keikoffer K Plane performance trim tabs, power assisted steering, and a stainless steering tie between the drives. The swim platform is integrated and has thru -hull exhaust below it and Captain's Choice exhaust option for thru drive exhaust at lower volume (and lower HP, of course). Both drive trim and tab trim indicators are cable driven pointer on the dash panel for positive readings. I grew up at a marina and my family is still in the marina business today, so reliability of the equipment is high priority on my list. The first thing I did after purchasing the boat was to thoroughly review the boat mechanically and repair, or have repaired, any issues that would affect the mechanical function and reliability. I also ran the Hull ID for a history fact sheet and found no known accidents or chargeable issues. The following items have been professionally replaced with new OEM parts: Pulled both drives to grease and inspect U-Joints and Gimbal bearings and replaced the following: 1. Both Gimbal bearings on the Bravo Drive housings (New Merc Quicksilver new style) 2. Intermediate shift cable & shift bellows on the Port drive (New Merc Quicksilver) 3. Both U Joint Bellows (New Merc Quicksilver) 4. Both Exhaust Bellows (New Merc Quicksilver) 5. Both drive seal kits installed (New Merc Quicksilver) Engine compartment work: 6. Replaced exhaust hoses for thru- hull pipes and added Stainless T-clamps 7. Replaced Both batteries just replaced today with new Exide Marine 1000 CCA batteries 8. Replaced Both Fuel Filters 9. Replaced Both Oil Filters & new Quicksilver Semi-Synth Oil 10. Replaced Both Water Pump Impellers (New Merc Quicksilver) 11. Replaced Both blowers and intake hoses (New Attwood Marine Inline) 12. Replaced Both horns (New Attwood Marine) 13. Replaced Both engine compartment lights (Replaced with LED floods) 14. Replaced Hydraulic / Electric Hatch lift Mechanism 15. Replaced all OE plastic thru hull fittings with machined Stainless Steel for durability and safety. Cosmetics: 16. Replaced rear cockpit speakers with new Pyle Marine speakers. 17. Replaced interior forward cabin indirect lighting - Added LED strip lighting 18. Brand new, never used compact porta-potty for cuddy cabin. Trailer: 18. New trailer wiring harness 19. New LED sealed Tail lights 20. New brake lines & Surge Master Cylinder 21. Added four trailer drive-on guides for one man loading and launching. 22. Added a new Powerwinch RC30 wireless remote control winch with remote triggered light for solo load and launch. New Gear: 23. New, nevwer used Porta Potty 24. New Garmin 740S GPS, Sounder, Navigation, Plotter w/ Speed. The trailer needs some cosmetic paint work on the reinforced frame stringers and a repair to the fender on the starboard side. The trailer is very road-worthy and carried this boat from Washington State to North Carolina! As you can see by the extensive list, all of the expensive work has been done. All has been repaired and / or replaced with new OEM parts; nothing aftermarket on my boats! I'll include new double braided black lines with orange snubbers, boat hook / paddle combo, flares, fresh water outdrive flusher, etc. The boat is equipped with a brand new Garmin 740S GPS chart potter with blue chart auto-navigation function, depth, and speed. The GPS unit alone is worth more than $1,000 with transducer / speed indicator. I've posted some fresh pix of the boat taken this past week. Free to contact me if you need any additional information.Thanks for looking and best of luck bidding on this awesome Reggie Fountain performance machine! One of the cleanest boats around. This is a 92 Formula 303 with Merc 454 Power plants. Only 495 easy hours on this second owner boat. The original owner had it in Laconia NH on Lake Winnipesaukee. He always stored in a heated garage and never left it in the water. It was then purchased in 2006 by its present owner, who also never leaves it in the water, and keeps it in his heated garage. Never has this boat been in the cold!! The cover is brand new with no shrinking whatsoever. Bravo One Drives are clean and she's pushed by Stainless Quicksilver Mirage Props! K Planes, Porta Potty and refrigerator make for easy day trips on this beautiful Formula. Included in this will be her Eagle Tri axel custom matching trailer with low miles and spare tire to match on awesome Mag wheels! Drop down bolsters and vinyl that looks like it has just come from the formula factory.....Still original! She needs a new home. Hope you fall in love with her! Please don't be afraid to submit any offers! Baja 290 Powerboat. Twin 454 MerCruiser Engines, Corsa Silent Choice Exhaust, Bravo One Drives with Quicksilver Mirage 25 Pitch Props, Stainless Pop-Up Cleats, Swim Ladder, Faris Gauges, Humminbird Depth Sounder, Dual Battery Switches, Richie Marine Compass, Drop Down Front Bolsters, Tilt Steering Wheel, VHF Marine Radio, Pioneer CD Stereo, Pump Out Head, Techsun Trailer with Brakes. This boat has been used and does have some stress cracks. Both engines start and shift good, boat was used last summer. Trailer is in good condition. If you have any questions or would like to see more pictures please email and let me know.